Denzel Washington, Chris Pratt, Ethan Hawke et al. DVD: 127 min., Blu-ray: 133 min. 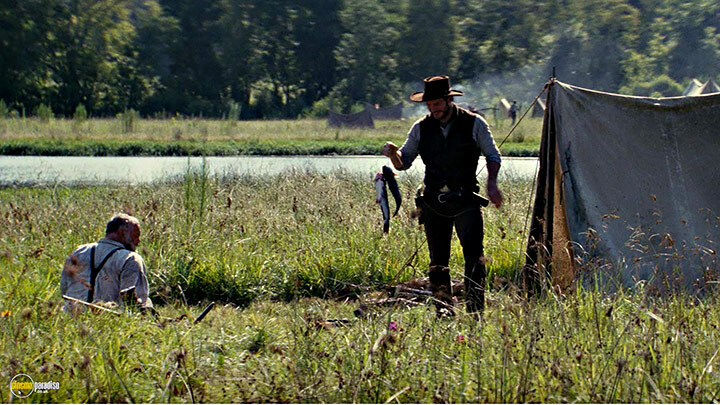 It is a confident film-maker who remakes the 1960’s seminal film The Magnificent Seven. No amount of confidence or star cast is going to make the film good if you don’t get it right. With some beautiful cinemtography and fabulous scenery as credit in the ‘bank’ as it was Antoine Fuqua frontloads the film with his go-to actors from his previous films in the shape of Denzel Washington (Training Day, The Equalizer) and Ethan Hawke (Training Day) and an actor whose star is high in the firmament Chris Star. Unfortunately on the whole the film fails to live up to the premise. The opening set-ups are entertaining if a little laboured, in particular the hand-holding and giant sign-posting that lets us know that Peter Sarsgaard’s character ‘Sir Jasper Naughty-Bonce’ is evil, like totally evil dude, was bordering on pantomime. I understand that if you looking for a realistic portrayal of the West in the late 1800s then don’t watch this film. This is definitely pop-corn, brain on hold, fare. Nevertheless, I do feel that my intelligence does not need to be insulted in quite the way it was from time-to-time. As entertaining as those opening scenes were the ending scenes were as disappointing. I get the feeling that the Marvel Universe style denouement is infecting action films of all types. This film had explosions, as many baddies and goodies being, shot, stabbed, blown to bits and generally murdered as the average small war. 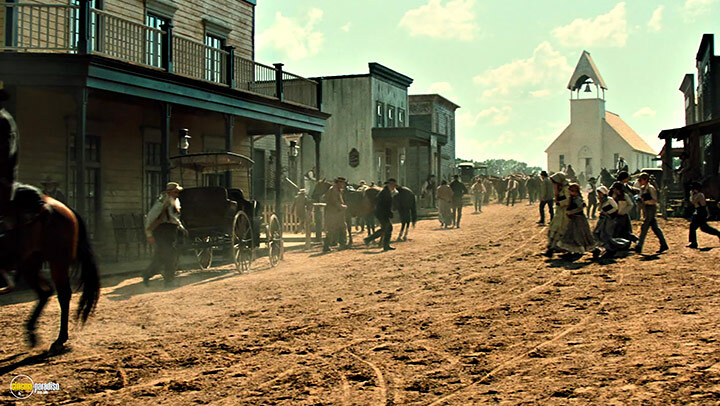 After the end credits rolled the people of Rose Creek need no longer worry about n’er-do-wells as the local population of them had been totally eradicated, along with ninety-percent of the town folk. Denzil Washington and Chris Pratt are always good value for money and the rest of the cast acquit themselves well in general. Peter Sarsgaard and Vincent D’Onofrio veer into pantomime territory on several occasions, particularly as D’Onofrio seems to be playing some sort of Brian Blessed hybrid. 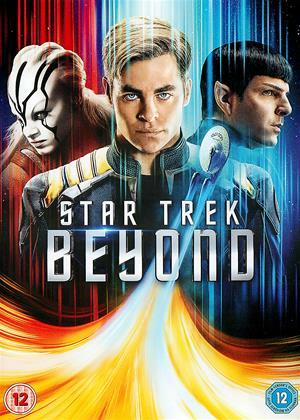 The need for every diverse type of population to represented in the ‘seven’ does not get me frothing at the mouth and red-faced as some reviewers and I can understand the modernising of the story but I’m not sure it was necessary in my view. 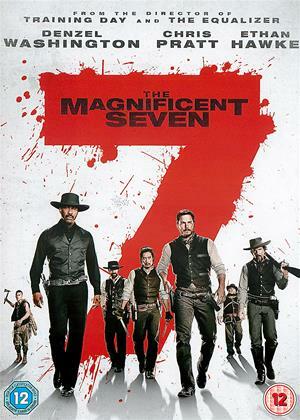 The Magnificent Seven was really The Average Seven and although the relentless drive for entertaining the multiplex masses has probably forced the hand of the director and producers I’m sure without such a big broad brush and some muted colours there was a good modern remake of The Magnificent Seven in there. Instead, this was slathered with the bright explosions of the ‘Why’s he doing that?’ crowd. Antoine Fuqua can make good films and tell good stories, The Magnificent Seven was a good film and a great story. It should have worked but in reality it didn’t. It’s a shame. I gave up with this after 40 minutes. Turns out they take a full hour to assemple the 7 with not a bit of action, very dull! An updated remake of the original film. For me done very well and a very good western. I can't remember watching the original sone can't compare which is better, I thought the cast was good and good fighting scenes. A grand old-fashioned western but one that springs no surprises and has no real high points. The over-familiar plot holds little interest and neither do the sketchily drawn seven characters. 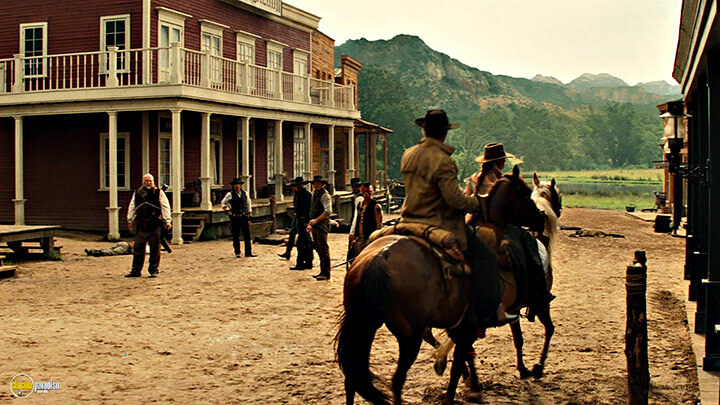 The gunfights are never more than perfunctory because the baddies can’t shoot straight and the Seven seem invincible until one or another goes out in a blaze of glory. The Wild Bunch it ain’t. The retro score by James (Titanic) Horner is also a drag. It’s hard to be critical because he wrote it without seeing any footage and was then killed in a plane crash. The resulting bland music is more of an homage to him that a help to the film. 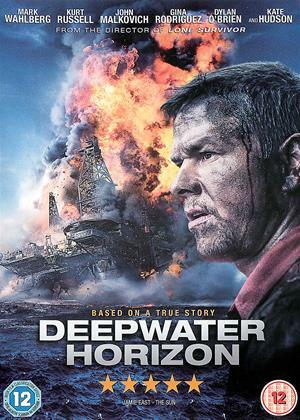 Yet director Antoine Fuqua never makes a boring film and it bumbles along nicely at a good pace. It’s watchable if only to notice what it lacks. 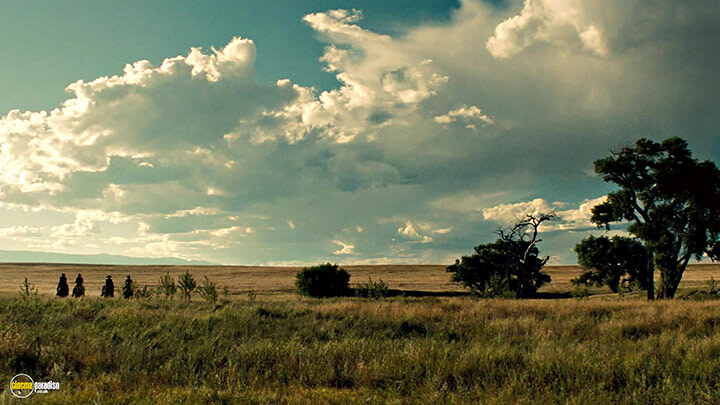 The best thing about it is the New Mexico scenery, built for wide-screen and luminously filmed with Fuqua’s sweeping camera. 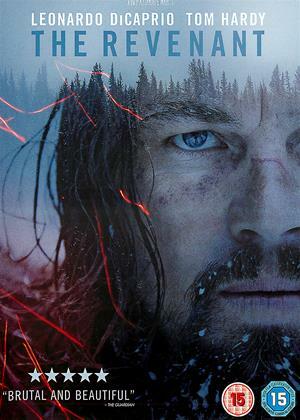 If only it held more resonance in the manner of modern Western classics such as Unforgiven and Open Range. In general agreeance with the other two comments on this film, it really is a new update of the classic, nothing new added, simply a remake staying true to the original. However what was really noticeable was the unnecessary need to have such a multi-cultural cast, even when it's not necessary or detracts from the storyline itself! There is a Native American Indian, an East Asian, a Black Man, two White Men, a Mexican and a Religious nutcase! 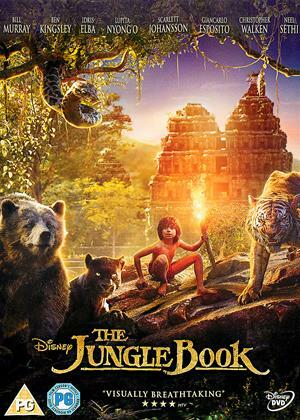 It seems as though they felt the need to cater for all races and also for the religious crowd out there, when it really wasn't necessary and adds nothing to the film at all! In fact I found the religious character really annoying, as it was way too heavy, shoving it in our faces all the time and for me this character ruined the whole film! It was an ok film, Denzel gives a strong performance as do most of the cast, but the script wasn't anything special and the bad guy lacked any sense of gravitas, in fact the bad guy was the weakest character in the whole film! Does the new Magnificent Seven blow away the original? Absolutely not, but that’s thankfully not the plan for director Antoine Fuqua. Having directed the loud and simplistic crowd-pleasers of Olympus Has Fallen and Southpaw, he knows where his strengths lie and it’s not in character development or new plot twists on the old formula. He specializes in crafting big, loud and blood-pumping action, designed to generate standing ovations from the most red-blooded of American audiences. Fuqua keeps the story the same. Seven unlikely men are hired by a town that’s threatened by evil men that take their money and kill their people. All the beats are maintained right down to the plan of attack and the exact number of deaths between the seven. Though the characters themselves fulfill the same roles, Fuqua brings a splash of color to the cast. Denzel Washington leads the pack as a sworn bounty hunter, dressed in all black. Byung-hun Lee plays an Asian assassin specializing in killing with knives. Manuel Garcia-Rulfo plays a Mexican veteran of the Alamo. Martin Sensmeier, a Native American, fulfills the role of a Comanche warrior. 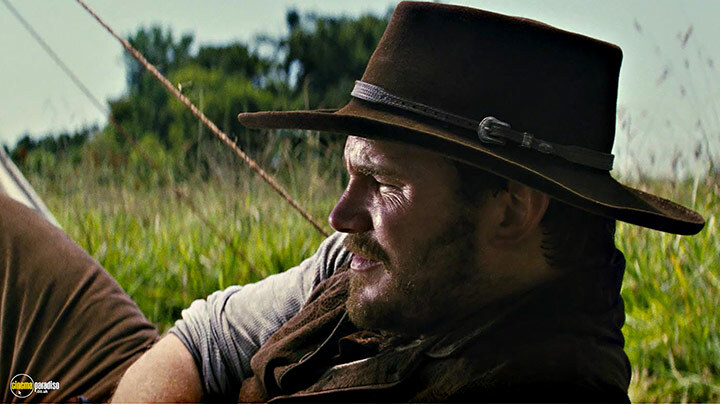 The always likable Chris Pratt plays a charismatic enough anti-hero, Ethan Hawke an uneasy veteran and Vincent D’Onofrio the crazy coot who lives in the woods. While this is a rather strong cast, they’re never really given any depth. 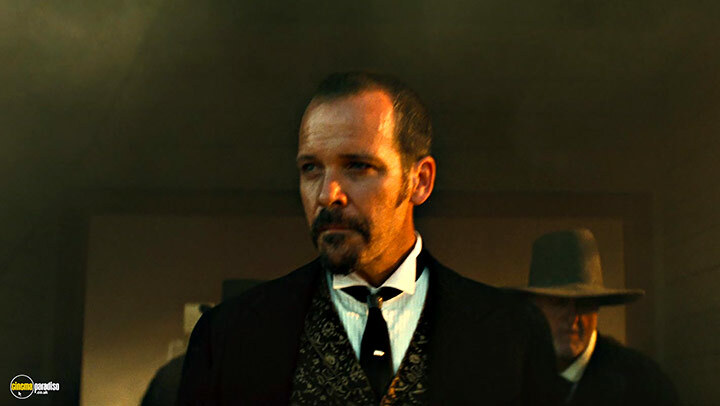 In particular, the villain played by Peter Sarsgaard is just a walking cliche of evil. He kills people randomly whenever the whim strikes him and has no motivation for his pillaging and murders. Likewise, the heroes are reduced to such simple figures that they spend more time making cheap quips than displaying any meaningful development. This wouldn’t have bothered me so much if it weren’t for the script deciding to pull out light pathos so late in the third act. Their dialogue is amusing to be sure, but the audience will be more laughing at the lines than the characters. For the first half of the movie, Fuqua attempts to make these characters both charming and badass. And most of these attempts fall flat on their face. I can still recall the astonishingly cool moment from the original movie when Yul Brynner and Steve McQueen defend a carriage from being attacked on their way to bury a Native American. I recently saw this new Magnificent Seven and can not think of one moment when these characters accomplished a comparable feat. I know, I shouldn’t be comparing this movie to its predecessor, but it was hard not to when this picture kept using that classic theme from Elmer Bernstein. It isn’t until the second half of the movie when the grand defending of the town turns the movie into an endless scene of action. Characters are shot up left and right by pistols, arrows and Gattling guns. Tomahawks become lodged in backs and knives are driven into hearts. Dynamite goes boom and horses go flying. Not only is the action noisily portrayed at a frenetic pace, but it also comes with the superhero formula where the heroes never miss and every bad guy goes down. In many ways, it becomes a mixture of both the classic themes of good-natured anti-heroes and the modern makeover of creating action built for a 7.1 sound system. 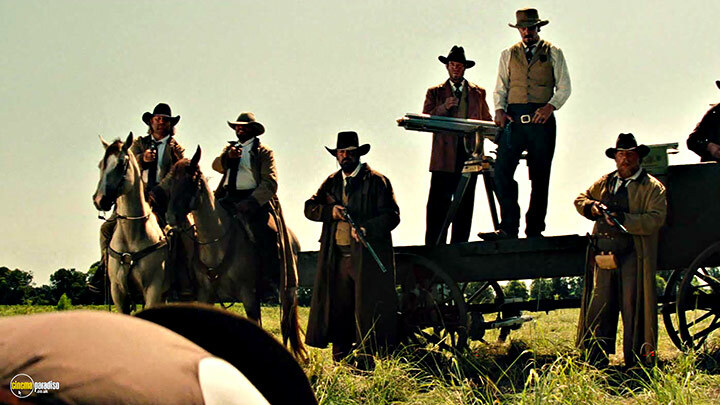 After trying to distance myself from the original and acknowledging that this Magnificent Seven is it’s own movie, I began to enjoy myself with a picture that, while lacking in writing, made up for its faults with Fuqua’s trademark action direction. There’s even some great cinematography with beautiful mountain scenes and solid lighting. But, again, I must stress this, do not go in comparing this to John Sturges’ classic western as that film was a perfect balance of story, character, action and cool. 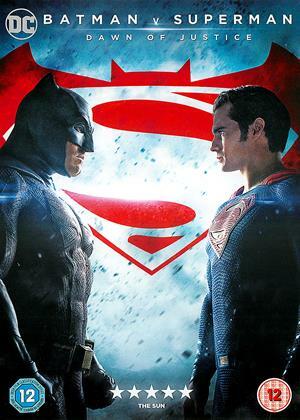 This new version is solid popcorn entertainment and succeeds at being just that; an excuse to turn off your brain and let your hands clap wildly for simplistic heroes saving the day.